You'll be £6.80 closer to your next £10.00 credit when you purchase Britain's Declining Secondary Railways through the 1960s. What's this? This is an evocative selection of high quality colour views, each of which recaptures the lost age of Britain's branch lines and secondary railways, of which so many were axed following implementation of the 'Beeching Report' during the 1960s. 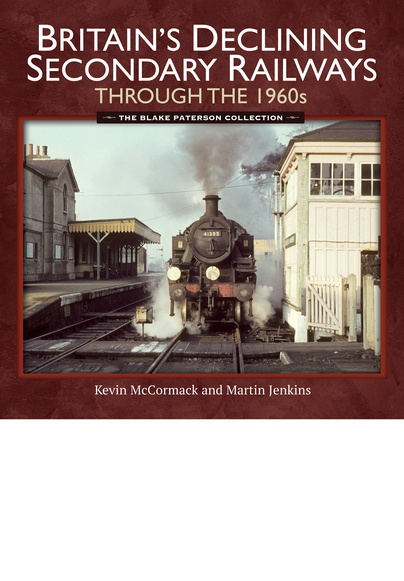 Most importantly, the previously unpublished views in this book are the work of one man, Blake Paterson, a professional railwayman, who was also an outstanding photographer who some forty-five years ago was determined to record as much of the passing railway scene as possible. He set himself demanding schedules and would often travel vast distances, sometimes using overnight trains, to reach the more remote comers of the rail network. During this intense period of photographic activity, when he took thousands of colour slides, he followed his own strict rules. He would normally only take a photograph when the sun was shining and he would try to capture the train in its natural setting. For Blake, ambiance was paramount. This book is a unique record of one man's railway portraits, featuring a wealth of locations, steam and diesel locomotives, DMUs, stations and station buildings, halts, signals, gas lamps, infrastructure, staff and passengers. Anything that was set to vanish, Blake felt should be recorded. His photographs provide a perfect pictorial record of so many of the lost splendours of Britains rail network. This makes for a great, non-technical read amply illustrated. A work of luxury that can not miss in the library of any lover of the railroads and a priceless documentation that recreates an era in all its splendour. Books of railway photographs are many, this is better than most. Very good as a nostalgia inducing record. This is a stunning and atmospheric book. It captures perfectly the pathos of the dying days of the Victorian railway in Britain. An absolute must for the enthusiast and modeller of railways. Only rarely does a book come out with vintage transport photographs in colour and we should be pleased that during the Sixties, Blake Paterson toured the whole of the UK snapping soon to be forgotten social history. The magnificent result is this book. This work is likely to appeal to a variety of readers. These could include railway enthusiasts, especially those with a specific interest in Branch Railways within the British Isles. Railway modellers with an interest in transition–era railways of the British Isles are also likely to find this volume of interest, while transport, social and political historians could find the images (especially what appears in the backgrounds) useful in their researching. From the early 1960s, Martin Jenkins took colour slides during the dying days of steam. In 1989 he directed a documentary for BBC Radio 4, To China for Steam. He has also directed and voiced many transport DVDs, as well as authoring and co-authoring books on trams, buses, ferries, railways and his home area of Merseyside.